Q. Cumbers has been in business for nearly three decades, opening on June 15, 1990 and operated under Sheila McCabe. Sheila’s husband Mickey took over as general manager with the birth of their first child, and has been running the business ever since. 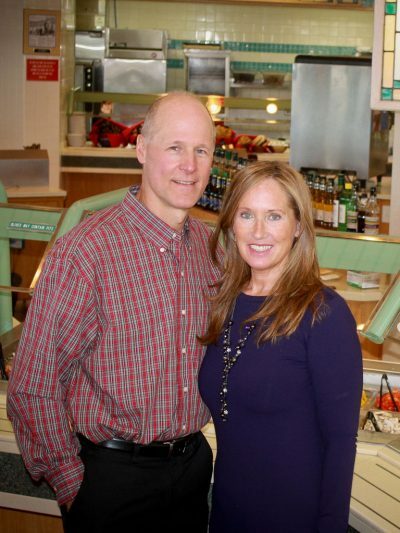 Q. Cumbers was sold to the McCabes in 1995, and prospered through 2000, when it was remodeled and updated. More recently, Sheila McCabe has come back on to help manage the business, and Q. Cumbers continues to be a gathering place for families, friends, and all types of people. We’ve always striven to be one of the more healthy restaurants in Minneapolis, with an emphasis on vegetables and homemade soups, salads, and entrees. We’re vegetarian friendly, but we still serve meat-based dishes of all kinds. We don’t add any MSG to any of our food, and we use the healthiest and freshest ingredients possible. With the wide selection of food we offer, there are all kinds of reasons to come to Q. Cumbers. Looking for a light “soup & salad” lunch? Our specialty. Starving for a 3-course meal? You can do that here, too. Business meeting? Hey, it’s bright and clean, with plenty to eat. Need a big salad to go with your own dinner? Take one to go. Q. Cumbers is like home to a lot of Twin Cities natives, regulars who come back again and again, forming a community around great food and healthy living. See what they have to say.